It has been pouring down in Illinois for the last couple of days and according to the forecast this would be no better for a couple more days too. Last weekend the temperature was at high 60s(def F) and we were glad thinking that spring has finally arrived! But the next moment it became cloudy and remained as such for a few days with temperatures barely above freezing after which it started pouring down! The gloomy weather confined us at home for most of the days. During such weather conditions how do you feel sipping a cup of steaming hot chocolate from Starbucks for free during the early mornings or late afternoons with the couple of dollars still in your wallet? This is exactly what this post is all about! Chocolate cookbooks never fail to fascinate me and seeing one of those in the bookstore aisles draws me like a magnet. Walking aimlessly through the Barnes and Noble aisles, a magazine on chocolate recipes caught my attention. Flipping through the pages I came across this Hot Chocolate recipe which claimed that it was an exact clone of Starbucks Hot Chocolate! Doesn't it feel good to have one with the pennies still jingling in your pocket? The recipe being short and simple was easy to memorize and had me running towards my small notebook on reaching home to pen it down. Mix cocoa powder, sugar and water well. Make a syrup out of it by microwaving for about 35 seconds. Stir well after removing from microwave. Add the syrup to milk and microwave again for about 2 minutes or until steaming hot. You may serve with a dollop of whipped cream and chocolate drizzle to mimick the cafe experience! 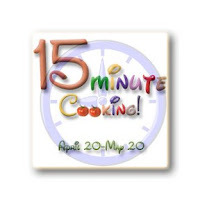 This goes to 15 Minute Cooking event hosted by Mahimaa of Indian Vegetarian Kitchen. Hot chocolate on rainy days seems like a poem:) Tempting snap. Poor you. Still waiting for spring. I live in Missouri and we have not worn sweaters from the beginning of April. The temps range between 60-85 from april right through mid June.Wonderful time here in spring. Nice post Pooja and hope u have some great weather soon. Hai pooja wow easy and simple 2dy i have to buy cocoa powder and yeast for pita bread and brownies.My husband love hummus and pita bread.when i saw ur recipes he was really surprised that homemade pita bread.Once agn thanx for the recipes. the hot chocolate is really quick n gives starbucks n cadburys a run for their money.........thanks for dropping by n my photos are just functional taken by my cell phone cam............i love good food though n appreciation always feels good.please be around. wow what a simple and yet tasty drink! thanks for ur entry. got ur email. It's so good to have a cup of hot chocolate on cold days!That cup looks so inviting-can I come over? We have the same weather here! Please pass me that delicious soothing cup! I'll finish in no time. :) Looks so refreshing and gorgeous Pooja! Perfect for this type of weather,here also same dear,last week it was 92 degree,now in the 60's..Enjoy weekend with hot chocolate.. Tempting hot chocolate,just love it! Yummy Hot Chocolate Pooja! Fabulous treat for a rainy day! Adding vanilla is a neat twist.. Hot chocolate looks lovely Pooja...simple and easy to make...nice entry. looks so delicious ,almost can smell the fresh aroma of chocolate and ready in just 10 mints or so wow great for this type of weather..
You made me go craving for hot choclate now!! Pooja, I love chocolate drinks. I have few bricks of cooking chocolate. Wondering if I can use it instead of cocoa powder. Will that make any difference? oh my kids didn't see this, otherwise I have to make it soon.. :)loved your pita bread too, Pooja! I too love the hot chocolate from starbucks..No doubt your looks exactly the same..Wonderful entry..
My Favourite drink. Looks so yummy. It is the same with me too....(The magnet effect towards chocolate)!